Marcel wakes up in an orphanage, with his memory wiped. He doesn't know who he is, with only a vague idea that his mother is no longer alive. The sorcerer (Lord Alwyn) gave Marcel a 'fake memory' using 'The book of lies'. He meets Fergus and Nicola (his sister) at the orphanage, both of who's memories are nothing more than lies as well. The story tells of their struggle to find out the truth about their real lives from all the lies and where few people are what they claim to be! Fire world is set in a universe called Co:pern:ica, where you can create an object by thinking about it, called 'imagineering'. The story is about David, who has been marked as an 'eccentric' (a threat to the 'Higher'). Because of this he is sent to the Librarium (a museum for books), where he meets Rosanna, and firebirds roam upstairs. They are like dragons, but are birds that breathe fire. When they injure one of the birds, they find themselves on a great adventure! 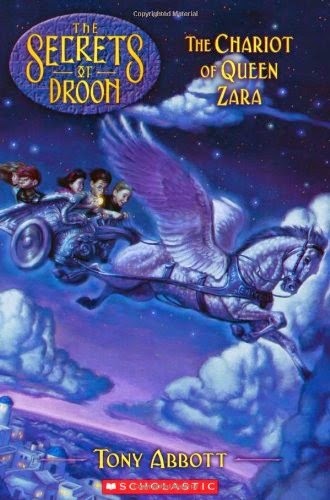 Eric and his friends go on a horse thing (a chariot hooked to a statue of a winged horse), to find/rescue their friend the wizard, who is trapped on the dark side of the moon. Rated: 2½ out of 5 - "So far I have only read one chapter, but I don't like it." Hiccup, the red haired Viking, goes on a quest to find the potato (the vegetable-that-no-one-dares-name) to help his best friend Fishlegs. He has been stung by the deadly Venomous Vorpent and has Vorpentitis. He comes across the leader of the tribe, Norbert the Nutjob, a scary dude with an 'axe of fate' who tries to get revenge on Hiccup, Gobba the Belch, a big hairy six foot dude who wears shorts in the snow, and Doomfang and a whole lot more! They do get the potato in the end but discover it's not needed as Fishlegs only has a bad cold. However, Hiccup does get Vorpentitis, but does not die in the end! Rated: 5 out of 5 - "I liked the great names for the characters like Fishlegs, Snotlout, Dogsbreath the Duhbrain and the different species and names of the dragons. I liked everything about it as I like mythical creatures. it's writing competition time again!